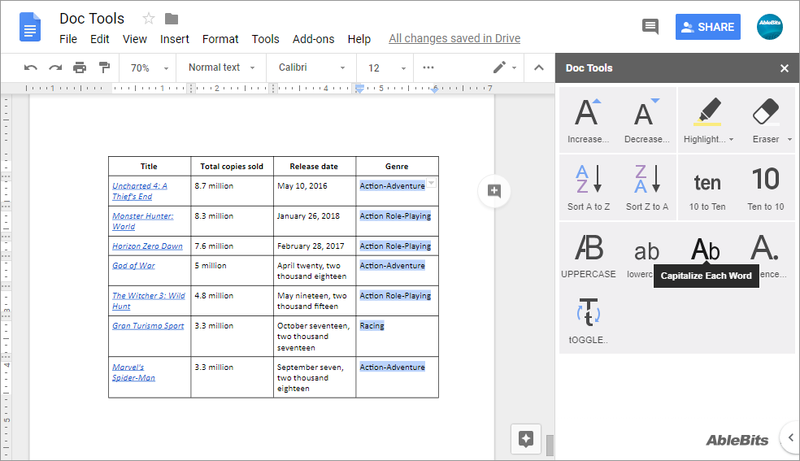 This add-on supplements your Google documents with a set of thirteen one-click utilities, each for a daily task that is cumbersome to perform manually. 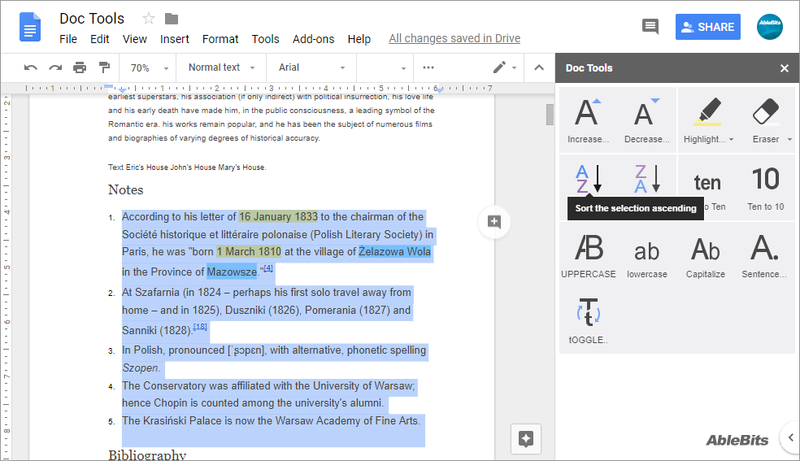 Doc Tools give you the easiest and quickest way to sort text, convert numbers to words and back, change font size and case, and add or remove highlighting from the text. Change case Put your text to uppercase or lowercase, capitalize each or only the first word in a sentence, or toggle entire text. Adjust font size Increase or decrease font size of the selected text. Spell numbers Scan the text for all mentions of numbers in figures and turn them into words, or vice versa. Add or remove highlighting Pick one of 5 colors to highlight the text or choose to remove all or particularly colored highlighters. Sort lists and tables Alphabetize records from A to Z and back. 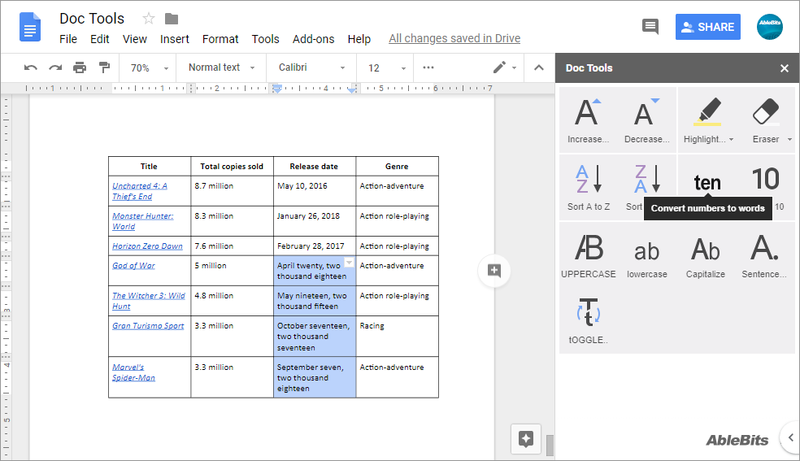 Perform all actions in a click Find all tools on the add-on sidebar or run the most common ones directly from the Google Docs menu. What are Doc Tools and what do I need them for? This set of instruments offers a straightforward sidebar to relieve you from all the minor text adjustments in your document. 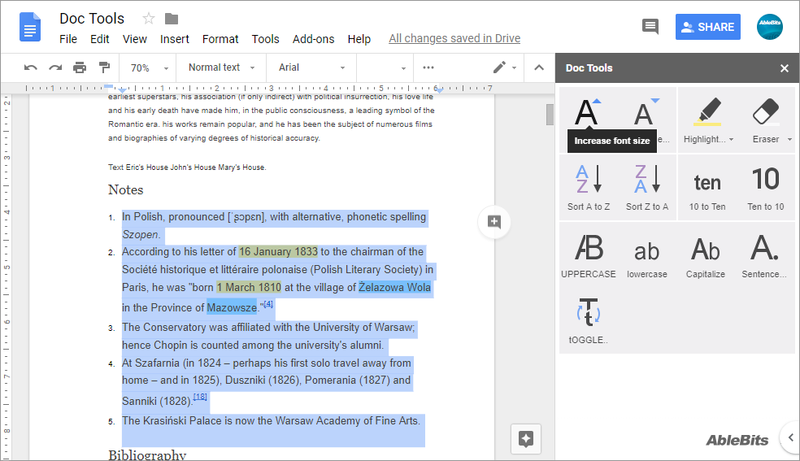 Install Doc Tools and you will change case and font size; add and remove highlighting; sort lists, tables, and numbers; and turn numbers to words or back to integers. Can’t I do all these with Google Docs standard features? Only few of these features are available in Google Docs. You can switch letters from lower to upper and the other way or capitalize each word. But you can’t toggle text and capitalize only the first word in a sentence while our add-on can. You can also work with highlighters and font size, but our utility changes these in a single click. 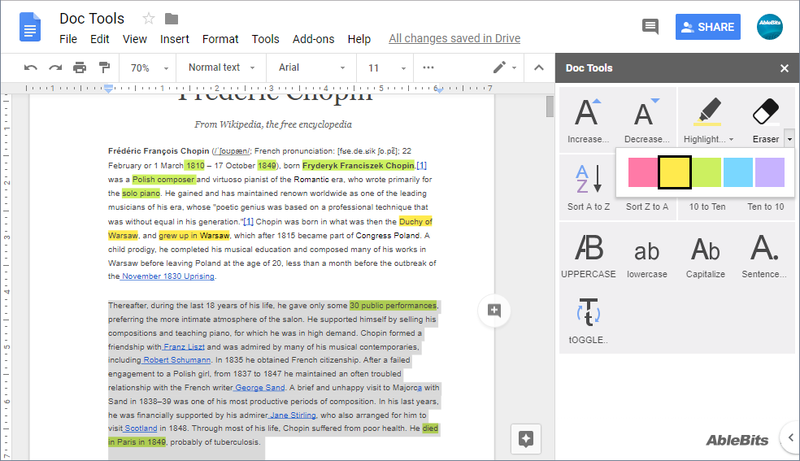 How to use Doc Tools in Google Docs? Or run the add-on and click one of 13 icons to perform the action. How does sorting work with your add-on? 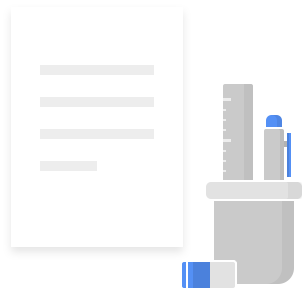 Doc Tools allow you to arrange your table rows, list items, or even headings with all their text in alphabetical order. Simply select them and pick one of the sorting options: ascending (A to Z) or descending (Z to A). You can even sort rows in a table by several non-adjacent columns! How does the add-on convert numbers? When working with numbers, you can get them both ways: spell numbers or replace words with integers. For example, your "427" will turn to "four hundred twenty-seven", while "seventy-seven thousand" to "77000". Can I change case with your add-on? 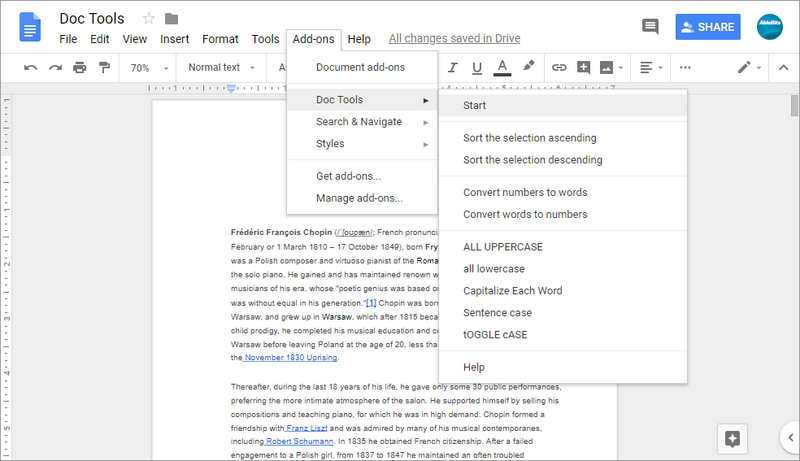 Changing case in the selection is as easy as clicking the necessary icon: capitalize each sentence or word, apply uppercase or lowercase, and even toggle case. What’s so special about your highlighters? The add-on offers 5 "muted" highlighters to single out the important parts of the text. You can utilize each of them with the possibility to remove all or just one particular color from the selection. How to switch font sizes with Doc Tools? Find the right font size by using the Increase font and Decrease font tools. Each click will apply the next size on the standard scale.